Terrible Torontonians, kleptomaniacs, and botched circumcisions—these are only a few of the hot-button topics shared among four women living in Stewiacke, Nova Scotia. You’re probably wondering, where and what the heck is Stewiacke? If you were to ask its residents, as in the title of Norm Foster’s play, they would tell you it’s Halfway to the North Pole. St. Catharines based theatre company The Foster Festival is a new up and coming company that produces the works of Canadian playwright Norman Foster, the first company of it’s kind in Canada to dedicate their repertoire to a still living playwright. Astonishingly, they have produced three performances out of the First Ontario Performing Arts Centre this summer: On a First Name Basis, Here on the Flight Path, and Halfway to the North Pole. Left to Right: Rita (Sheila McCarthy, Mary Ellen (Helen Taylor), Sean Meritt (Darren Keay), and Vi (Lisa Horner). Photography by David Vivian. 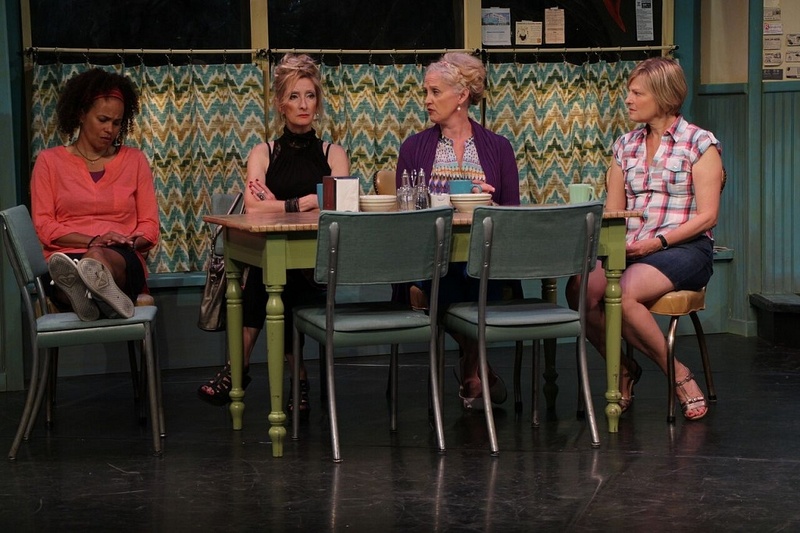 The last play of The Foster Festival’s inaugural season, Halfway to the North Pole graces the stage at the First Ontario Performing Arts Centre with a vibrant cast and a story of these women’s not-so-simple small town lives. Janine Babineau (Kirsten Alter) runs a small-scale diner called Junior’s which acts as the backdrop for the events that unfold. Every evening after 4:30 the diner closes, and in comes Vi, Rita, and Mary Ellen (Lisa Horner, Sheila McCarthy, and Helen Taylor) with the day’s town gossip. What stirs the pot is the arrival of Sean Merritt (Darren Keay), a recently divorced doctor from Toronto (a breed not held in high esteem in this town) who is to replace the town’s regular doctor for a month. The women immediately take interest in this new handsome stranger—all except Janine that is. What follows is a story of personal growth, revelation of inner truths, and the realization of just how sacred the bond of friendship is. Setting and costume designer Sue LePage uses colour in a complimentary way, both in the costumes of the four friends and the diner setting. From scene to scene, the garments worn by McCarthy, Taylor, Horner, and Alter create a cohesive balance of colour on stage, yet each character has a distinct style. Rita’s outfits are edgy with a touch of flash; Vi reminds me of the eccentric aunt archetype whose traveled the world; Mary Ellen wears sensible and functional clothing; and Janine is more on the comfortable and sporty side. In every scene there seems to be a thematic colour, first various blues, then purple, and red. This reveals how in sync the friends are and how their differing styles and personalities fulfill a specific role in their group dynamic. Janine Babineau (Kristen Alter) and the gang at Junior’s. Photography by David Vivian. LePage and lighting designer Chris Malkowski have created an atmosphere that brings me back to summers at Dayna’s Diner in Plaster Rock, New Brunswick (population 1,135). Malkowski’s use of soft yellows and greens for the walls and furniture accompanied by simple, one-tone overhead lighting, sets up a laid-back atmosphere that contrasts the complex web of events that unfold. The most compelling element of this performance is the clear character arcs and development made obvious by this brilliant cast. As the play progresses we see how the characters’ private lives differ from their outer appearance—Vi immediately comes across as quick-witted, no-nonsense, and bit of a wiseacre, but when it comes to her nine year relationship with her boyfriend, her affinity for love and devotion shine through. The practical one of the group, Mary Ellen seems content in her marriage and loves her boys to pieces, but deep down she feels under-appreciated and eventually strives to take control. Janine and Sean both have reservations when it comes to love—Janine lives with a man she claims to “love a little bit” and Sean still keeps his ex-wife’s picture in his office, but together they both realize that it’s okay to move on when your heart’s in the right place. Rita and Janine have a heart-to-heart. Photography by David Vivian. The standout performance for me is Sheila McCarthy as Rita—she sets Rita up as an unapologetic flirt, strikingly independent, and in control of her own happiness, but after a dramatic revelation, Rita delivers an emotional monologue about her inner turmoil years after the event that turned her life upside down. McCarthy brings to her role a sense of honesty when it comes to Rita’s fears of loneliness, but reveals that it is the friendship of Janine, Vi, and Mary Ellen that fills her with hope for her future. McCarthy, along with Alter, Horner, Taylor, and Keay all bring zest and wit to their roles that had me routing for each character throughout the performance. Halfway to the North Pole hooks you in with tear-inducing humour, then proceeds in engaging your tear ducts in a more touching way. Foster sets us up in a world of stability and simplicity, only to break it apart and leave us feeling heart-warmed, but yet oddly uneasy with the twist in the final moments.